If this card is destroyed by a card effect, Special Summon this card during your next Standby Phase. 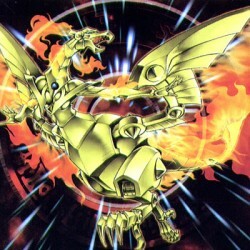 If you Special Summon this card successfully in this way, destroy all Spell and Trap Cards on the f.. If this card was Special Summoned by the effect of "Ultimate Insect LV3", as long as this card remains on the field, decrease the ATK of all your opponent's monsters by 500 points. During your Standby.. This card is unaffected by your opponent's Spell Cards. If this card successfully attacks your opponent's Life Points directly, during your next Standby Phase, send this face-up card to the Graveyard .. This monster gets the following effect(s) while there is a monster(s) with the following Attribute(s) on the field: • FIRE: Increase the ATK of this card by 500 points. • WATER: Control of this card c..